Norwegians have one more reason to smile, not that they need it. 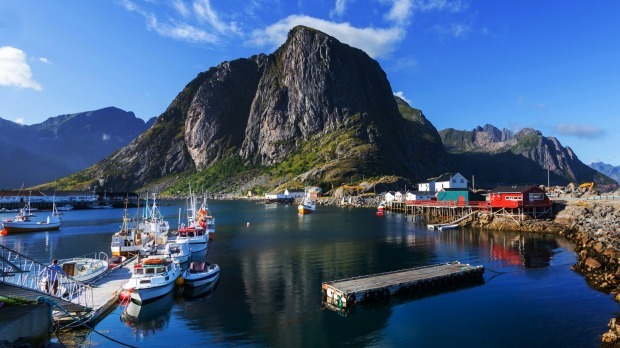 After placing fourth last year, Norway is now the world's happiest country, according to the 2017 World Happiness Report, released on Monday. The Central African Republic was the least happy of 155 countries. Australia came in at 9th place, behind New Zealand (8th) and Canada (7th), but ahead of Sweden at number 10. It's the same spot Australia occupied in last year's report. The authors of the report found that a half-dozen socioeconomic factors explain much of the difference in happiness among countries, but that social factors play an underappreciated role. As evidence, they cite periods of substantial economic growth that were nonetheless matched by declining happiness in China and the United States, which ranked 14th. 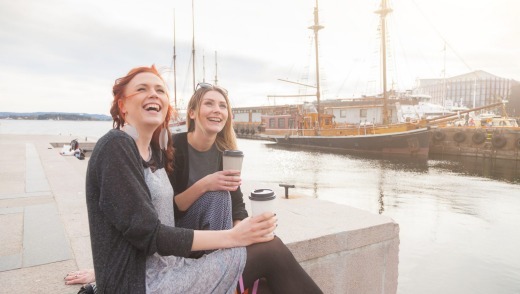 Even in Norway and several other Nordic countries that dominated the top of the list, economics alone did not explain the high rates of happiness. "It takes good social foundations and trust," said John Helliwell, one of the report's editors and a professor emeritus in the Vancouver School of Economics at the University of British Columbia. While high education levels had a positive effect on happiness levels overall, Australia was an exception, the report said. The report was prepared by the Sustainable Development Solutions Network, an international panel of social scientists convened by the United Nations. It was edited by Helliwell; Jeffrey D. Sachs, a Columbia University economist; and Richard Layard, of the London School of Economics. "Please imagine a ladder, with steps numbered from 0 at the bottom to 10 at the top. The top of the ladder represents the best possible life for you and the bottom of the ladder represents the worst possible life for you. On which step of the ladder would you say you personally feel you stand at this time?" Humanity is about halfway up the ladder, with an average global score of 5.3, based on hundreds of thousands of surveys conducted by Gallup over those years. The top five countries - Norway, Denmark, Iceland, Switzerland and Finland - all have scores just above or below 7.5. The Central African Republic's score is nearly 2.7. The authors found that three-quarters of the variation among countries can be explained by six economic and social factors: gross domestic product per capita (a basic measure of national wealth); healthy years of life expectancy; social support (having someone to rely on during times of trouble); trust (a perceived absence of corruption in government and business); the perceived freedom to make life choices; and generosity (measured by donations). In Latin America, life evaluations are about 0.6 points higher on average than would otherwise be predicted by those indicators. East Asian countries have the opposite problem, reporting less happiness than would be expected based on those factors. In both cases, the authors credit, at least in part, cultural differences. Still, they argue that those six factors explain much of the variation in happiness around the world - and that nations ignore the social factors at their own peril. Take the United States, which ranked 14th this year. Despite gains in per capita income and healthy years of life expectancy, happiness in the United States declined 0.51 points between the two-year periods ending in 2007 and 2016, they found. "We're getting richer, but our social capital is deteriorating," Sachs said. Social support, trust, perceived freedom and generosity all suppress happiness in the US. And to offset that drag economically, gross domestic product per capita would have to rise from about $US53,000 ($A68,000) to $US133,000, he argues. "The country is mired in a roiling social crisis that is getting worse," he wrote in a chapter dedicated to America's flagging happiness. "Yet the dominant political discourse is all about raising the rate of economic growth." To fix that social fraying, Sachs argues policymakers should work toward campaign finance reform, reducing income and wealth inequality, improving social relations between native-born and immigrant populations, overcoming the national culture of fear induced by the Sept. 11 attacks, and improving the educational system.